IMSA announced today that BAR1 Motorsports' #16 car, a hilariously liveried "SpongeBob SquarePants" Prototype Challenge entry, failed to meet the minimum drive time required for one of their amateurs at the Rolex 24 at Daytona. IMSA isn't cutting them a break on it, either. Because it's a flub concerning an amateur driver, IMSA isn't giving BAR1 the same leniency that they showed Wayne Taylor Racing for keeping one pro driver in the car for too long. WTR merely got moved down to last place in their class, still picking up the points for a sixteenth place finish. BAR1 won't even be assigned a finishing position for their penalty. Prototype Challenge is a pro-am class, where driver rankings come into play. Many pro-am teams rely on amateurs (the drivers who best fit the intended definition of a "Silver" or "Bronze" ranking) to pay the bills, and to make things fair in a class designed for amateur participation, each driver on a team must get in a minimum amount of time in the car. This way, you can't have an actual amateur go out for a couple laps only to be put aside for the rest of the race while professionals on the team hustle the car to a better finish. "For the competitive balance and fairness for other teams with different driver configurations in the 'pro-am' environment, minimum drive times for bronze and silver-rated drivers must be enforced," explained IMSA Race Director Beaux Barfield in a press release on the penalty. Simply put, not giving your amateur enough drive time in a pro-am class is an unfair competitive advantage for the class, and that's why they're not showing BAR1 any mercy for the flub. Minimum drive times are established per race, depending on the length of the event. For the pro-am GT Daytona and PC classes at Daytona, this minimum was 4 hours and 30 minutes for the whole event. Because they used two Platinum drivers on the team, the team's two Silver or Bronze drivers both had to be in the car for at least that amount of time. 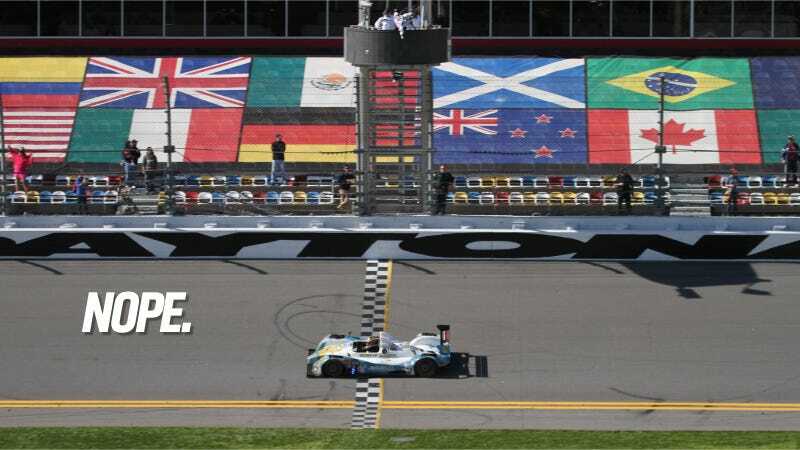 No finishing points or Event Point Fund / Prize Money are awarded to any Driver that does not achieve the minimum requirements, laps or drive-time specified, in each Car for which they are declared to be eligible for championship points. This means that all the drivers in the number 16 car—Tomy Drissi, Johnny Mowlem, Brian Alder, Tom Papadopoulos and Martin Plowman—lose their points for the race itself. The rest of rule 12.5 is just as harsh on the car itself, stating that the car's second place finish is "not considered in the order of the results for the purposes of awarding any finishing points or Event Point Fund / Prize Money." So, the team's second-place finish has been deleted as well. Not moved to the back of its class. Nuked from orbit entirely. According to Sportscar365, the only points anyone gets to keep for BAR1's #16 car is the one point given for starting the race. What's odd about this penalty is that a competitive advantage is not being penalized harsher than a safety issue. Tired driving is a serious concern in endurance racing, and many fans are now calling foul on IMSA giving leniency towards Wayne Taylor Racing's violation. Both are serious offenses, so it's hard to argue which one is actually worse. IMSA argues that BAR1's penalty is "consistent with a penalty assessed to the No. 94 GTD team in the 2014 Rolex 24 At Daytona, which also had one pro-am driver miss the minimum drive time requirement" in its press release on the matter. Because of this ruling, the disco inferno of CORE Autosport moves to second place in Prototype Challenge, and JDC-Miller Motorsports gains a podium finish in third. UPDATE: Bakkster looked through each driver's time, and it looks as if Brian Alder was the violating driver, with only 1:54:30 spent in the car. That's not just a little bit off. That's "I can count to potato" off.